Monday March 16 1908 Will came home early and slept a little. I did churning in evening and had dinner so I went down at 12.12. I took Fannie butter and was up to the other house awhile. I walked over to Woolfs and came home at 4.39 with Billy who was down there sawing wood. I wrote Lydia in evening Will down to Woolfs again tonight. Tuesday March 17 1908 I was busy with the work all forenoon. Will busy about the place. I had a letter from Lydia and wrote more to her. Will and I rode down to Woolfs in afternoon. 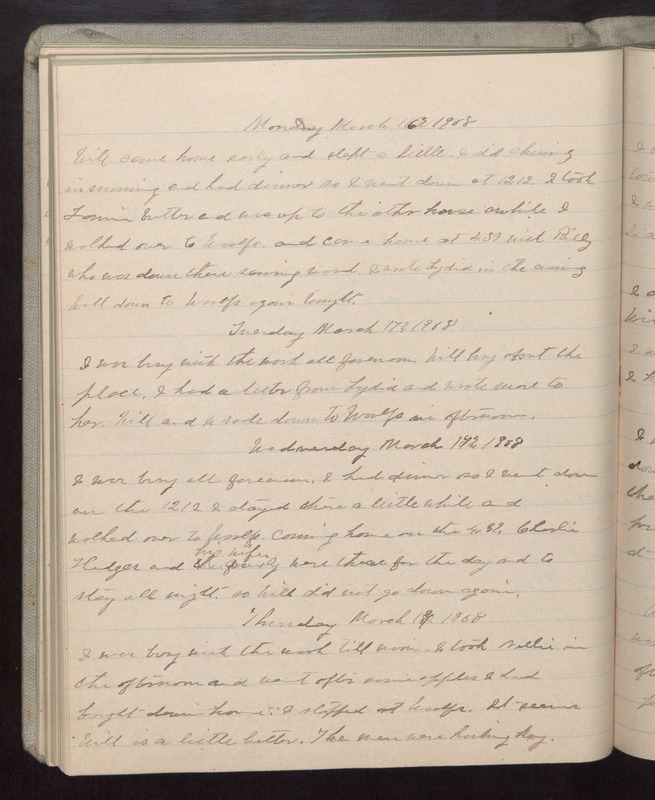 Wednesday March 18 1908 I was busy all forenoon. I had dinner so I went down on the 12.12 I stayed there a little while and walked over to Woolfs. Coming home on the 4.39. Charlie Hedges and his wife were there for the day and to stay all night so Will did not go down again. Thursday March 19 1908 I was busy with the work till noon. I took Nellie in the afternoon and went after some apples I had bought down home. I stopped at Woolfs. It seems Will is a little better. The men were hauling hay.